To make the sponge preheat oven to 210ºC/ 425ºF/Gas Mark 7. Whisk the whole eggs with almond and sugar powder and the lemon oil, or zest, until light. Use a spatula to transfer this mixture to a large, clean bowl. Sift the flour onto the mixture and set aside. In a separate bowl whisk the egg whites until they start to froth then add the pinch of cream of tartar. Once the egg whites start to stiffen and slip around the side of the bowl. Add the caster sugar and beat until the meringues stiften. Spoon about ? of the meringue into the egg/flour mixture and stir gently to incorporate. Now add the remaining mixture and fold in gently with a spatula. Put a prepared 24cm cake tin onto the weighing scales, and return the reading to zero. Weigh 240g (9oz) of the batter into the tin. Smooth the batter with a small palette knife until evenly distributed across the surface. Fill another 3 cake tins of the same size using the same quantity for each. Transfer onto baking sheet in pre-heated oven and bake for 10-12 mins till pale golden and firm to the touch. (Do not overbake or the sponge will be dry. If this happens, brush generously with a liqueur, or a simple sugar syrup). Remove from the oven. Wait 2 mins and turn out onto cooling racks. Remove the paper slowly. The greased paper will come away easily. Allow to cool completely. Whip the cream with the icing sugar and rosewater using a balloon whisk to soft peak stage. Meanwhile, add the tub of soft cheese into a bowl and cream it with a wooden spoon for a couple of minutes or use a hand held whisk. Add the softened cheese to the cream, and mix it in slowly with the balloon whisk until just incorporated. The combined cream and cheese filling will now be of pipeable consistency. Place one disc of cold sponge onto a cake board that is about 2.5cm bigger than the sponge itself. Brush with limoncello all over surface. Put approximately 1/4 of the cream filling onto the brushed surface and spread evenly to 1cm from the edge. The thickness of the filling should match approximately the thickness of the sponge layer – see photo. Put a quarter of the cream filling into the piping bag and pipe a small border around the edge of the sponge disc. Place the next disc on top of the filling, pipe as before, and continue as for first disc. Also for third disc. The final top disk does not have any filling. Instead brush with warmed jam to create a sticky surface to hold the raspberries in place. Finally brush the raspberries with the warm, raspberry glaze. Put in fridge for at least 1 hour to set. If made for the next day, place the cake in a large plastic, sealable container to prevent drying out overnight in the fridge. 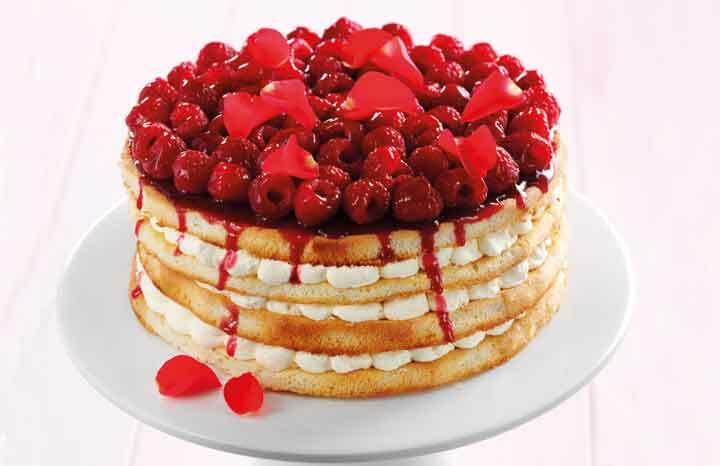 To present the cake for special occasions, scatter rose petals around it. Kenwood will crown one of these five recipes as the Nation’s favourite “Elizabeth Sponge” on 13 September at Goodwood Revival and until then, cake connoisseurs can vote for their favourite recipe on the Kenwood Facebook page www.facebook.com/KenwoodWorld. This sponge recipe by ex British Bake-Off contestant Brendan Lynch is ideal for a celebratory summer party!